Gloria Laycock is Professor of Crime Science at the Jill Dando Institute, University College London. 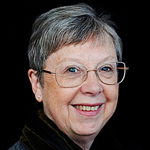 She established the Home Office Police Research Group in 1992, has acted as consultant on policing and crime prevention in several countries, and is currently Director of the Partnership Programme for What Works Centre for Crime Reduction, co-funded by ESRC. I wanted to change the world. I’m still working on it. Two – the first as a civil servant in establishing the Home Office Police Research Group, which I like to think contributed to persuading the police that social science research could actually be useful. The second was in 2001 when I established the UCL Jill Dando Institute of Crime Science. I think this multi-disciplinary institute, which combines social, physical and computer science in trying to solve policing problems, is now making its presence felt. We have some amazing staff. The list is long – I could mention global warming, population control, non-renewable energy, poverty – but they all come down to inequality in one form or another; that is a significant ‘wicked issue’ today. That said, the threatened clash of civilisations, now perhaps better characterised as a clash of cultures, looms large. Difficult… I think a number of disciplines have come to the same point from different directions and are in agreement about the importance of the immediate situation in determining behaviour. This has taken the emphasis off the deep social structures as the immutable drivers for human activities and placed it where it more properly belongs in the present. As a consequence we can see ways of addressing a wide range of social and behavioural problems, including preventing crime, which is my professional concern.